In 2014, three sediment cores were collected from the northern [Xinyanggang (XYG)], middle [Chuandonggang (CDG)], and southern [Xiaoyangkou (XYK)] parts of the coastal tidal flats of the North Jiangsu radial sand ridges (NJRSR), East China. The grain size and contents of heavy metals (Cu, Zn, Cr, Ni, Pb and As) in the cores were detected. The features of sediments and the accumulation of heavy metals were also investigated. Multivariate analyses (principal component analysis and correlation analysis) were applied to identify the sources of heavy metals. The enrichment factors (EF) were calculated to estimate the level of contamination stored in these sediments. The results showed that the vertical variations in the contents of heavy metals were compatible with the sedimentary features. The grain size in core XYG became coarser around the 1980s and the contents of heavy metals began to decrease. The grain size in core CDG was suddenly refined around the 1960s and the contents of heavy metals suddenly decreased. The grain size in core XYK coarsened initially before becoming finer and the contents of heavy metals were basically stable. The contents of heavy metals of the NJRSR coastal tidal flat were subject to the sedimentary parent materials of the abandoned Yellow River Delta and the offshore radial sand ridges. Several heavy metals were disturbed by anthropogenic activities after the middle and late 1980s. The content of Cr in core XYG was mainly from industries. The contents of Pb and Zn in core CDG were from agricultural, urban and industrial sources. Cu and As in XYK were from agricultural and industrial sources. 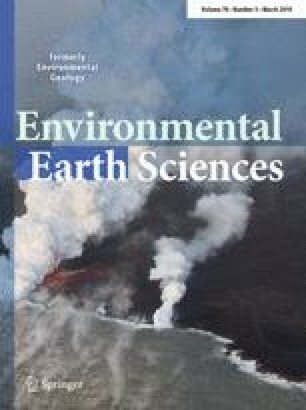 The environment of sediments in the study area was generally good, but was polluted by individual elements after industrialisation. Cr in core XYG was moderately and significantly polluting, Pb and Zn in core CDG were lightly polluting, Cu was moderately and significantly polluting, and As was lightly polluting in core XYK. The online version of this article ( https://doi.org/10.1007/s12665-019-8125-3) contains supplementary material, which is available to authorized users. This work was financially supported by the National Natural Science Foundation of China (No. 41373112).